Academic Qualification (at least 2nd division) from public sector-private sector universities, colleges recognized by higher education commission Government of Pakistan. 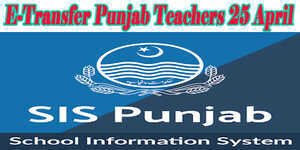 The government of Punjab School Education Department vides Notification No. SOSE(III)5-11/2016 dated 25-09-2017 has upgraded the Post of PST/ESE from BS-09 to BS-14 and EST(SESE from BS-14 to BS-15 w.e.f 01-01-2018. 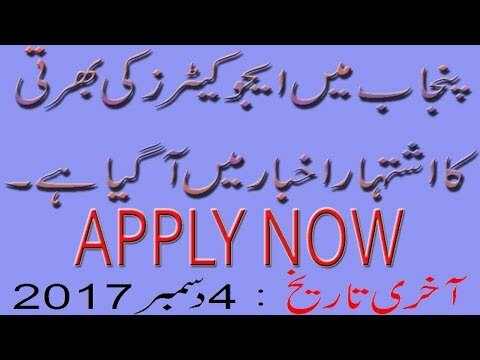 Candidates from all districts of Punjab can apply for entry test. Male/ Female candidates may also select test center as per their convenience/choice. However, they will have to mention their domicile district in the form of generation of the result. In case of a married woman, their result shall be declared according to the domicile of their husband domicile. Upper age limit for fresh candidates including general relaxation in age limit as per government policy is as Male 35 years, Female 38 years and Disable 40 years. Applicant having the 3rd division in any of his /her education career i.e Matric, Intermediate, Bachelor, Master in prescribed qualification or any prescribed qualification will not be eligible to apply against the posts under the recruitment policy 2017-18. Result cards of previous NTS test shall not be valid for current recruitment. Last Date for Submission of Applications is 04 December 2017.